I love to read. And I want my kids to love reading, too. I also want to keep their minds sharp during their summer vacation. One of the best ways to accomplish both things is to get them reading as much as possible over the summer, though that can be easier said than done. My girls--like most children--are eager to have summer. They want to go to the beach and play outside and watch as much television as they possibly can. Reading is not often at the very top of their lists, though all of them enjoy reading. So I have a few tricks up my sleeve to keep them motivated to read, and once they're into a book I usually don't have to remind them. As soon as school is out for the summer, our local library has a summer reading kick-off party. It includes crafts, storytime, and ice-cream and my girls love it. Anyone can sign up for the program--adults too!--and you earn 3 prizes throughout the summer as you complete your reading list, which is a little different for every age group/reading level. We earn a new book (my favorite! ), a free ice-cream cone, and a swimming pass. The girls can't wait for library day whenever they know they've got a prize coming. Our local bookstore also has a reading incentives program, so we do that one as well. Check out your local library and bookstores to see what they offer, because they most likely have something going on to motivate your children to read. Many national companies also run cool reading programs, some of them online so you don't necessarily have to have one in your area to participate. Saving with Shellie has compiled an extensive list of these types of summer reading programs HERE. We (try to) have an hour each day where all of us (except maybe The Maestro if he is at work) go outside on the deck and read. It's my favorite time during summer days because I get to sit out in the sun and read with my favorite people in the world. And it's something they look forward to doing as well. I also read to them every night during the summers. We've read many books this way, and not only does it help get them excited about whichever book we're reading, it helps them go to sleep, too. Which is not an easy task when the sun stays up until 11:30 pm! A couple summers ago I read a few of the Little House on the Prairie books with them in preparation for our visit to the Laura Ingalls Wilder Homestead in DeSmet, South Dakota. I adored these books as a child and it was so fun to share them with my children. We have done a summer book club for our girls and their friends for two summers now, and they really love it. So far, only Bria and Chloe have done it, but Sophia is going to have one of her own this year. Not only do my girls love it, their friends really enjoy it, too. It's basically an excuse to have a super fun party (I mean, that's kind of why I love my own book club) and we do make it fun. We do a craft based on the book, have a discussion, play some games having to do with the book, and eat something yummy. Last year, Chloe and her friends read Wonder by RJ Palacio and we had an amazing party book club! We are in the planning stages for this summer's book clubs right now. We still have three weeks of school left, and we want to have the invitations handed out by the last day of school. We can't wait! 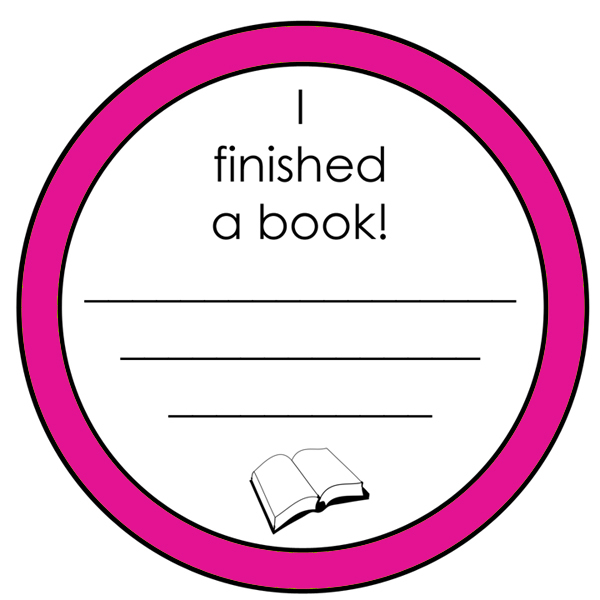 Every time my girls finish a book during the summer, they fill out one of these little tags and put it in the little bucket in their reading bins (click here to see the bins with the buckets inside--scroll down a bit). For every three books they read, they get to have a small reward like a trip to get ice-cream, an item from the dollar store, or extra electronics time. For every 12 books they read, they get a trip to the local bookstore to choose out a new book. That's one book a week, but they always manage to earn it. And then they read their new book, too! Pretty neat trick, hey? To print out a page of 12 tags, click HERE. I use a 2" circle punch to cut them out, just so I don't have to tediously do it with scissors. 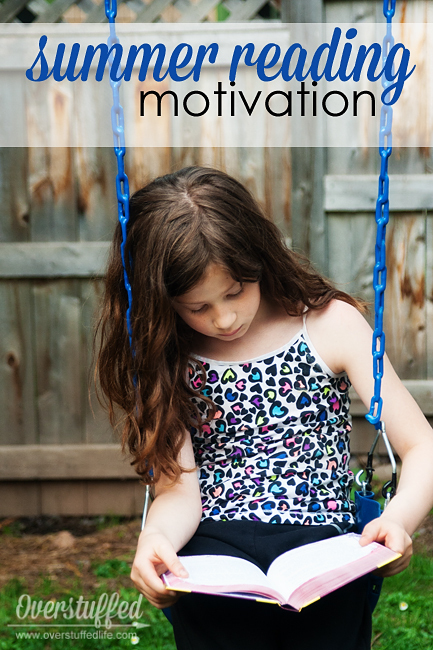 How do you motivate your children to read in the summer? This post linked up at: A Bowl Full of Lemons - One Project at a Time Naptime Creations - Create, Link, Inspire Living Well, Spending Less - Thrifty Thursday Creative Home Keeper - Book Notes For the latest posts from Overstuffed, subscribe by email or follow me on Facebook. This post may contain affiliate links, for more information, please see my disclosure. I LOVE all these ideas! Love the Book Club Party. Love the "i read a book" incentive. Love the reading in the sun idea. I used to read to the kids every night, but haven't done it for a couple years. Thanks for this awesome post. Do you have a good Book Club book suggestion for nine year olds between 3rd and 4th grade? Great ideas! I have one who will read ANYTHING and two who have to be motivated. I love to read, so I'm not sure where they got it! If they haven't read Wonder yet, I'd highly recommend it. It's perfect for that age group. The year before we did From the Mixed-up Files of Mrs. Basil E. Frankweiler, and that was a big hit. My middle daughter was between 3rd and 4th that summer. And I think both boys and girls would enjoy both books. Yup. Weekly visits to the library are a summertime must! We can't swing it during the school year as often as I'd like (and we pay so many fines because of it! ), but the summertime is library time! Yes, I never had to be motivated to read, either. I just love it so much I chose it over just about anything else. My kids like to read, but getting them to read in the summer hasn't always been easy. And these days the pull of electronics is so much stronger than it was when I was their age, so that's another obstacle to overcome. I was obsessed with reading as a kid! My mom started a "reading list" with goals for me when I could first read on my own and its something I continued for a very long time. I would set goals for the summer or the school year and always read way more! I am hoping my kids will love reading, too. I linked it above, but in case you missed it, here are the activities and such we did for our Wonder book club. I think the first step to having kids that love reading is to love it yourself...so you've got great chances if you ask me! My kids just joined the reading program at the library for the summer and they are pretty excited. The party idea is a great one. Ha! We think a bit alike. Next week I'll be sharing a reading challenge for my readers...for themselves AND to do with their kids. This is a great idea. Our best reading month is July when we go tech-free for the entire month at our house. Of course they read throughout the year, but I highly recommend trying an entire month without tech, it is incredible. We'll be having our 4th consecutive year this summer, can't wait! (FYI, I check email in the morning and night since much of the kids' summer sports and events are communicated online and of course I answer my phone, no Facebook, surfing the net, pinterest, nothing, and all tv, gaming systems, iPods are packed away for the month and we enjoy life). The reading program at the library is one of my girls' favorite things all summer. I love that they get so stoked about it! My girls and little boys adore The Little Houses books. We also invested in the DVDs of the TV series which has been a fun accompaniment to the stories. This is so cute. I was an avid reader as a kid, actually, so avid, that I didn't even need any incentives not to read, I actually needed incentives to STOP reading. There's nothing more rewarding than the adventures inside a book. I think leading by example is powerful for kids, I probably read so much because both my parents did so too, we had a house full of books and my dad would always spend countless hours at the bookstore. The book club idea is gold too. I have no kids, but I have friends with young kids that love reading and I must pass this idea on to them! Having a book reading incentive is a great idea. I usually make my kids log what they have read, but giving them something to work for would be a great motivator! Great idea! I really need to have my kids watch some if the shows, too. Little House on the Prairie--books and tv show--are a huge symbol of my childhood! That is how I was, too. My mom used to have to ask me to stop reading and do other things. I just think kids today have a lot more distraction, especially in their electronics devices, and even if they like reading--and my kids all do--they are more easily pulled away by the lure of flappy birds. ;) I guess we had Nintendo, but my brothers always hogged it anyway! These are all fantastic ideas. I'm a children's librarian so thank you for advocating for the library! We do so many fun and exciting things all summer centered around reading! If you're looking for something humorous, I suggest checking out the books by David Lubar. Very appealing for boys, but a lot of girls like them too! Thank you! I have not heard of these books, either (I do have all girls), but I think my youngest would really like them after browsing a bit on Amazon.